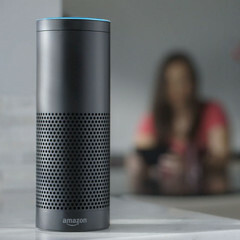 Although there is no official confirmation yet, insiders familiar with the matter claim that a successor for Amazon's two-year-old virtual assistant-powered speaker is already in the works. Amazon Echo, launched in June 2015, is a very popular speaker that features a voice-controlled virtual assistant. In the meantime, more Echo devices arrived, such as the Echo Dot, Amazon Tap, and the Amazon Echo Show. However, the original Amazon Echo only received a UK-exclusive white variant and no major changes. Insiders familiar with the matter claim that Amazon is working on improving all areas of the Echo speaker, even those where it already reigns supreme. For example, the seven microphones compete with Apple HomePod's six and Google Home's two mikes, but it looks the Amazon Echo 2 would get more. When it comes to music, the single tweeter+single woofer setup is expected to get "several tweeters." At last, it looks like rounded edges would replace the flat ends of the current model. Engadget reached out to Amazon for comments on the upcoming device, but no response has arrived yet. The rumors claim that Amazon Echo 2 (this name is not official, of course) should arrive this fall, but we should take all these with a grain of salt for now and wait for an official statement.